Finca Estrella with its stunning views of Pavones Bay, the Gulf Dulce and the Osa Peninsula became ours in 2003. 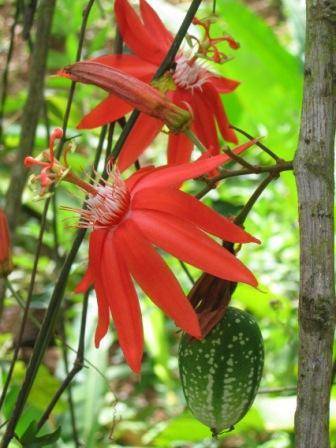 She is a 150 acre jungle paradise snuggled in the hills of Cuervito de Pavones in Southern Costa Rica. An hour from local Golfito airport and just ten minutes drive from the stunning beaches that stretch for miles in both directions. Elevated enough to catch the cooling breezes that are heaven if you are lazing in a hammock by the 18m pool and a welcome relief if you are wildlife watching in the finca, hiking to the waterfalls or venturing out on horseback. If you would like to read the hilarious and compelling book 'A Friend Laughs' by Jo Freeman, the story of our first 18 months in Costa Rica then visit 'A Friend Laughs'. Finca Estrella has four beautiful rental houses: Casa del Sol (Sun House), Casa Roja (Red House), Casa Amarilla (Yellow House) and Casa Madera (Wooden House) that sleep from 4 to 9 people. An 18 metre (60 ft) swimming pool with rancho/grill area and children's pool, obligatory hammocks and use of our horse are also included in the very reasonable rental prices plus Freddy, Enrique and Grace are on hand to ensure you have the best possible Costa Rican experience. NEW!!! 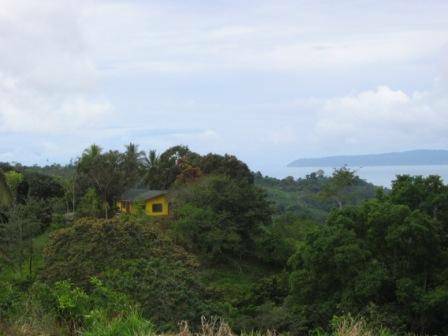 An amazing development opportunity just outside Golfito. A spectacular 60 acre finca with an all weather road joining 14 beautiful building sites, each with fabulous ocean views and easy river access at Hacienda Paraiso near the new marina in Golfito. Please contact us or click here to visit the website for more information about this fantastic investment or development opportunity. Named after the wild cat that has been spotted there.